Freeing ourselves from the cycle of ego suffering is a matter of seeing through the deceptions of our own internal psycho-physical habits, conditioned thought patterns, self-limiting beliefs, fears, and projections. We mistakenly take these habits to be who we are, and the result is a continuous cycle of frustration, dissatisfaction, and suffering. By practicing witnessing these habits of mind with self-compassion instead of judgment, relaxing our identification with them, it’s possible to discover the refreshing sense of space, relief, and well-being that are hallmarks our most essential nature. In this course we’ll explore in a modern, practical, and experiential way, the colorful Buddhist psychology of ego, the false sense of self which is the cause of so much of our suffering. We’ll use traditional teachings as a map that we can use to navigate the realms of ego territory and find our way out of its confusion. Teachings will explore so-called positive and negative mental processes, ‘poisons’ and antidotes, psychological ‘realms’, and the constituents of ego itself. This course is a deep dive into our own psyches and finding our own inner resources to grow into new positive ways of being and relating. Pre-requisites: This course builds on previously acquired skills and knowledge. 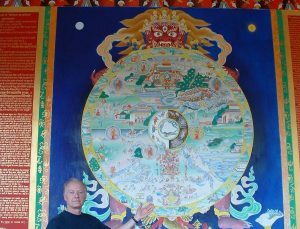 It assumes experience in contemplative insight meditation and completion of at least 2 courses at the Committed Level (or equivalents). Students must have experience with the R.A.I.N. meditative technique for inner work on emotions and beliefs. Completion of the courses Radical Self-Acceptance or Freedom from Unconscious Beliefs is strongly recommended. This special price includes “Relaxing the Grip of Ego” and is only available when signing up for the course. Early bird discount of $30 if registered by January 7. For those who are unable to attend our onsite class, ClearLight offers an Internet only option. Under this option, the weekly audio recordings from each class are made available each week via our website. Requires computer and internet access. This special price includes the recordings from the 10-week course plus the “Relaxing the Grip of Ego” Retreat. Click here to read about the retreat.